We have lots of new members joining us all the time, so occasionally I like to invite you to re-introduce yourself so that new members can get to know you and you can get to know them. When you post your introduction, please tell us how you would LIKE to be described by others. In other words, tell us how you want to be perceived by others. You may want to include how you want to be described personally or professionally, or both. I believe that when we can see ourselves as we want others to see us we are closer to becoming who we really want to be. Linda Miller is a Spiritual Entreprenuer whose desire is to help as many people as possible realize their potential to create abundance, prosperity and well being, with an overall umbrella goal of raising the consiousness of the planet on a spiritual level. Linda does this by seeking out resources and tools to share with those who are attracted to the products and services she is offering through network marketing, affiliate marketing and internet marketing. Linda Miller is making a difference in thousands of lives every day! Describe yourself as you would like to be perceived... compliment yourself and SEE yourself as you already are or as you would like to become AS IF you already are. When you can see yourself as being successful in creating whatever it is you want to create, others WILL also see you that way. I hope you enjoy this exercise and I really hope you participate. Want to be a Lawn Chair Millionaire? Lisa Wald Guarino is a well-known artist who loves creating images of animals and nature. She has a special love for horses that shows her in many award winning works. She offers her wonderful images on gift items, as card and t-shirts. She has the perfect gift items for any animal or nature lover. She also offers pet portrait services. She has recently expanded her portraiture services to people portraits. Families of "lost heroes"(soldiers) can contact her for services. Melanie Strick Melanie Benson Strick is the world's leading expert on building a lifestyle business with leverage -- getting massive results with a little effort. Melanie has tranformed the businesses of millions of entrepreneurs who formerly strugged with overwhelm and lack of profits into six and seven figure super stars. She has been featured on CNN, Oprah, Today Show and numerous radio shows on small business success. For more information on how to transform your business from the one you have to your ideal lifestyle business, take our free Lifestyle Business Profile at http://www.successconnections.com/profile. Steven�s goal is to help people stop struggling with life, and start living life the way it is meant to be lived�effortlessly and joyfully. Through his book, his talks, his workshops, and his free weekly inspirational emails, Steven teaches people the world over how to recognize and cooperate with the divine flow in life . . . a flow that is continually guiding us toward the effortless fulfillment of our heart�s desires. Steven currently lives in Sedona, Arizona, and is a highly sought-after and nationally recognized speaker. For more information bout Steven, and to see what other people are saying about his work, visit: http://www.rowrowrow.com. It is a pleasure reading about Lisa and who she is. Her work and what she offers the world sounds fascinating. Thank you for letting us get to know Lisa. Dennis Miller, Attraction Marketing Yahoo for Melanie! She sounds like a very smart cookie who is helping many others also create success. Be sure to tell Melanie we appreciate her! Dennis Miller, Attraction Marketing You know, I have heard about that Steven Lane Taylor. He has become so popular I hear he is getting more speaking engagements than he can possibly accept. And I KNOW his book is the best so it is wonderful to see it up there ranking with other great books... right where it belongs. Jennifer Ryan, M.Ed. Jennifer Ryan is a Psychotherapist, Life Coach, and Speaker whose life work has been dedicated to helping individuals free themselves from depression, anxiety, fear, anger, and chronic dissatisfaction. You've seen her on Oprah, CNN, and KERA's "Think," and have heard her on over 50 radio interviews across the country. Change is the easy part; the process is what keeps us stuck. Let Jennifer take you on a walking tour of the brain as she helps you make a connection between what is subconsciously guiding your thoughts, emotions and actions, and how to embark on the life YOU were meant to live! Private Reply to Jennifer Ryan, M.Ed. Wow! I love your introduction and I am thrilled for your success. I have actually seen you on TV and heard you on the radio many times so I am very pleased to meet you and honored to have you participate in our forum here. Steven Taylor I am honored to be your friend, Jennifer, and a source of inspiration for you . . . as you are one for me. Cathy Elaine Cathy Elaine is a Minister and Ambassador of Touch. Her desire is to be God's hands extended to the world in loving touch. She manifests this desire through Massage and Reiki Therapy and through written and spoken words that touch hearts. Her passion is to touch lives and to facilitate healing and positive change in the lives of everyone she touches. George Castro George Castro, LMFT is a licensed Marriage and Family Therapist and Life Coach who is known internationally for his ability to use his wisdom, creativity, and intuition to inspire, empower, and support others to reach their highest potential. He has authored and co-authored many books on parenting, coaching, and therapy. He has been featured on radio and talk-shows, and continues to speak on how to create prosperity and abundance in our life. George lives in Hawaii with his wife and daughter and gives back to the community by volunteering his time at local non-profit organizations. It's great to hear from you and to read your introduction. I can feel your passion and I know that you are truly making a difference in the lives of everyone you meet. Many blessings to you Cathy! PS - Success is an inside job! It is certainly a pleasure to read your introduction and it is wonderful to know there is someone in the world like YOU who is having such a profound effect on the lives of everyone he touches. Many blessings to you George! Thank you for the wonderful words and introduction. I don't know if you're familiar with Jack Canfield but he talks about a "come as you will be" party in which people "act as if" at the party to see what it feels like to step into that role. Of course I am familiar with Jack Canfield. He is one of my HEROES! Jennifer Ryan, M.Ed. Hello to George and Cathy! Wishing you well, and so glad to be in the company of such great practioners. I am so intrigued with Reiki; my business partner received it during one of our mastermind groups in Vegas, from a fellow masterminder, for her morning (read: ALL DAY) sickness. George, we have a lot in common! How long have you been in practice? The Eagle: Motivating Champions Around The World I am Richard "The Eagle" Motivator. I am honored to have joined this great Group. I am eager to meet the other members of this great network. Diana Kennedy I am Divine Diana (Kennedy). I am known as a spiritual healer, speaker and writer. People know who I am because they listen to my internet radio show. They recognize my name from being published in well known spiritual and holistic health publications. Most of all they know me because of my open heart! People say, "Oh, I've worked with Diana. She shared incredible insightful information with me through her angelic messages and healing energy that changed my life and helped me live from my Higher Self. I recommend her to anyone who is ready to move to the next level of joy, love, peace and prosperity!" They also know my great husband and children and know that he and I co-minister a Unity Church together. My email is shared freely dianackennedy at yahoo.com so that my love-offering healing and insight sessions can be sprinkled around the whole world. P.S. Visit the Life Enrichment Network on Ryze and contact me soon about the healing/insight sessions! Natalie Aguilar Great idea Linda! And, it is fun to read the posts and reaccquaint myself with most of you. Dr. Natalie Kahn Aguilar is a a spiritualist minister, psychic artist, teacher, and energetic Tune Master. She would say "energy healer", but she considers it accurate to say she facilitates clearing of energy centers and chakras and gets the flow going so the client can relax and access their own inner wisdom. She works with quartz crystal layouts around the client and Reiki energy during crystal therapy sessions. She uses her artistic training to create aura portraits and personal healing mandalas for clients. These works contain information from the person's energy field and are used in personal meditation to facilitate spiritual growth and even physical healing. Since quartz crystals are a personal passion, she and a partner have recently launched Earthfire Visions. Through this business they sell unique crystals and stones to the metaphysiscal community. Natalie likes to think of herself as a facilitator and system buster. 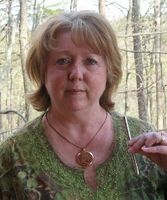 Atalanta Lloyd-Haynes Atalanta Lloyd-Haynes is an artist, healer and Dreamspell Practitioner dedicated to Planetary Awakening. She practices energy, sound and crystal healing and makes Kin Essences - gem essences tuned to creation tones and chakra vibrations. She is a member of the Birdtribes network, a network of individuals dedicated to Planetary Awakening and Service. Maria Marsala Maria Marsala, an internationally known Internet veteran and author is an American Business Guru who helps financial professionals and owners of service businesses who think BIG -- to build bigger, better businesses -- faster! She does this by supporting her clients as they streamline and automate the parts of business they love to ignore over and over again but come back to bit them in the ___ -- the planning, administration and marketing. Her company, Elevating Your Business provides coaching, consulting and training virtually and throughout the USA. Additionally she's created a highly sought after program "Corporate Secrets for Small Business Success" to help her clients and business owners world-wide. Maria's motivational speaking retreats, workshops, teleseminars have been highly rated by business owners world wide. She travels extensively in the USA helping her clients boost their profits and get their business foundation up and running smoothly. Thanks for that great introduction... and we love the twist! Gwen R Gwen Rebbeck is a Spiritual Entrepeneur who brings a spiritual connection into the day to day lives of her customers through her jewelry. Gwen does this by using components in her jewelry that have spiritual significance as well as beauty. Who says you can't be spiritual AND sassy! I am Charlie and I am winner because everything works well to them that love God. I own a network marketing business in telecommunication, inlcuding voice over IP phones and video conferencing solutions. My intent is to help others grown their business through the effective use of the emerging technologies, either to reduce their operational costs or to increase efficiency and productivity. I believe I offer a telecommunication solution that addresses the two issues above. More information on how this is possible is forth coming in the near future, but in the meantime please see my website for details on the products. Welcome to the network and thanks for introducing yourself. I look forward to your continued participation! Many blessings for your prosperity and well being! I greet this day with love and I succeed. Nikkole Abbas is a social enterprise consultant and marketing director of 7Gens. Located in Rapid City, SD, this family-owned business has helped expand social enterprise and green business in South Dakota by supporting new social entrepreneurs in their efforts. Services include web design and consulting for green businesses, social entrepreneurs and nonprofit organizations. Nikkole believes most people want to enjoy true integrity in all aspects of their lives, living and working in true alignment with their greatest values. She tries to be an example of this and does everything she can to help others do the same. 7Gens has built a community for socially conscious individuals and businesses to discuss--and yes even debate various issues at http://www.7gens.com and provides tips for green businesses as well as individuals at her blog at http://7gens.blogspot.com. With Nikkole's support, socially just and sustainable businesses are growing in SD and around the region. I thought about putting around the world above, but not sure I can yet suspend my disbelief on that one. I can visualize becoming a regional leader in green business, however and feel myself moving in that direction every day. Thanks for ur nice words about my visualizations. I visited your beautiful Green sites. RUTH MUNRO Hi Ruth is a strong and understanding girl whos joy for life touches all she meets, She has a direct no nosense approach which reflects in the trust people feel being around her. People come to her invited by the warmth given off by her true self revealed to her through her perosnal journey of self reflection and growth which she delights to share with others ,considering it her 'true path' in life. Ruth shares an amazing bond with nature especially horses where her life values culminate, Ruth never ceases to better herself and share her knowledge with humanity and is know for her work with those less fortunate. Wonderfull to meet you all ! The King Hi...I am a Psychic and astrologer.I posted this on twitter Jan.5 and you can check it out for yourself: Jupiter moves into Aquarius today.While not the best aspect,this transit may bring humanitarians some optimism.Especially concerning Gaza. This aspect will last a year. Perhaps the "war" will not last a year? Israel began to pull out of Gaza a day or 2 ago? 2 weeks! http://twitter.com/sirmercy Also go here to see my trial for fortune telling. http://www.theking.cc/testimonial.html My web site is www.theking.cc Thank you. Dennis Miller, Attraction Marketing Welcome Charles. Sounds like you have had some exciting times. Thanks for sharing a bit about yourself.